The posters document the myriad campaigns fought by feminists for justice and equality in Australia including access to childcare; protection from violence; free and safe abortion; non-sexist education; pay equity; social justice for minority groups; affordable housing and many more. Since producing their posters, many of the artists in the collection have gone on to make a name for themselves in the arts as photographers, print makers, book illustrators, gallery directors, textile artists and academics in fine arts. 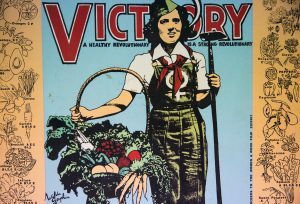 Many of the posters have been digitised and the Library is keen to make better use of the poster collection by including the posters in exhibitions, publications on the history of the women’s movement and on the website. For this reason, the Library has approached the poster artists, where names appear on the work, to seek copyright licence agreements. The bulk of the collection is made up of ‘orphan works’, ie, works with no identifying features of either the artist or the printer. Any artist who reads this and thinks that their posters may well be in the collection, please contact the Library. To showcase the poster collection, the Library occasionally publishes individual posters or themed posters and related commentaries on its website. 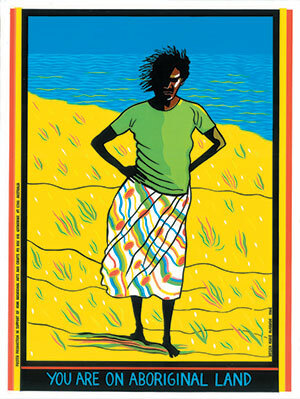 The first of these is the iconic ‘You Are On Aboriginal Land’ poster designed by Marie McMahon. Marie McMahon studied painting at the National Art School at East Sydney Technical College. In 1976 she joined Earthworks Poster Collective at the Tin Sheds at the University of Sydney and worked as a designer with Redback Graphix in Wollongong and Sydney during the 1980s. From 1988 she lived in the Northern Territory, working in Aboriginal art centres and as a remote area tutor. She taught drawing in the Faculty of Architecture at the University of Sydney until 2011. In 2010 her work was included in ‘Kent State–Four Decades Later’ at the Sydney University Art Gallery. The subjects of her artworks have been social, political and environmental. A number of her exhibitions were concerned with the natural environment of Northern Australia, specifically site, flora, social significance, cultural history and environmental effects. More recently she has exhibited works about Indochina and in particular about Cambodia. Her 2009 show at Damien Minton Gallery, ‘The Watery Kingdom’, was about Cambodia. When Marie gave permission to the Library to publish the poster, she also told us how the poster came about. Read her story here.